The eBay award winning vintage outfit known as In Vintage We Trust is starting the new year off with a bang! 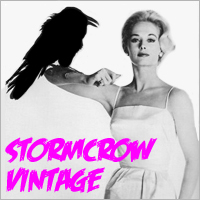 300+ auctions for vintage tees all starting at $9.99. But they aren’t just auctioning tees – they’ve got 700+ goodies up for grabs from all walks of the vintage clothing genre. IVWT were recognized by eBay.ca for their exceptional customer service practices which landed them the “Service-preneur” of 2011 honors. Translation: we can definitely trust In Vintage We Trust.